⇒ During the 1960’s there happened a widespread famine in Mizoram caused by a regular failure of the bamboo crop due to mautam. ⇒ India failed miserably at that time to send adequate relief in time. ⇒ This led to the formation of a protest group called Mizo National Famine Front. ⇒ Deprivation soon led to open rebellion. ⇒ On February 28, 1966, the MNF launched Operation Jericho under which about 1,500 MNF cadres overran Lunglei, Aizawl and Champhai districts by defeating Assam Rifles personnel stationed there. ⇒ A week later it was captured again by the Indian army. ⇒ The 20 years that followed this operation comprised insurgency battles. ⇒ Government on the other hand launched excessive village resettlement schemes so that MNF could be driven to the jungles and cut off its recruitment base and supply lines from the villages. ⇒ If MNF was such a great threat then why did India started negotiation dialogue with them. ⇒ India knew that MNF enjoyed majority in the Mizoram. ⇒ The two options available with India were – War or Diplomacy. ⇒ War was not going to bring peace in this area. So India choose diplomacy. ⇒ MNF on the other hand accepted India’s proposal to contest in the election as a political party. ⇒ So, elections were held in 1978. ⇒ MNF’s Pu Laldenga lost to Brig Sailo of the People’s Conference. ⇒ As the MNF stepped up its insurgent activities in response to an electoral loss, the government decided to end the matter more decisively. 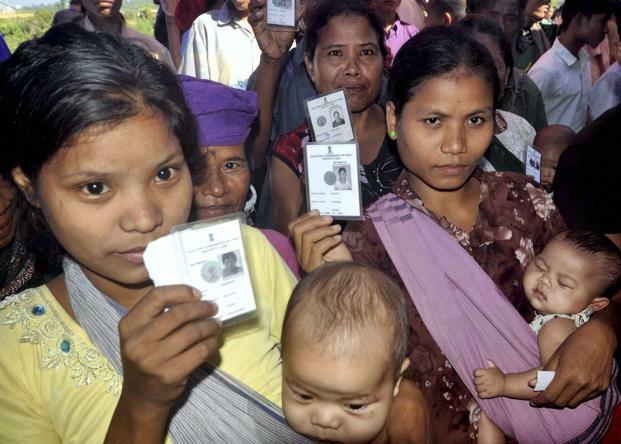 ⇒ So, this first electoral experiment in Mizoram failed miserably. ⇒ In 1986, the Union of India under Rajiv Gandhi and the MNF signed the Mizoram Peace Accord. ⇒ Pu Lalthanhawla,(the Congress Chief Minister), was made to step down and Pu Laldenga of the MNF was made Chief Minister. ⇒ Rajiv Gandhi did it because he wanted the violence to end and wanted Mizoram to stay with Union of India. ⇒ Practising accommodative politics seemed the rightway forward even if it meant replacing the Chief Minister with Pu Laldenga, who had spent the better part of his adult life deep in the jungles of Myanmar raising two armed brigades to fight the Indian state. ⇒ This experiment proved successful. ⇒ As we know that MNF came to power in 1986 by the peace accord. ⇒ But it survived only for a period of 2 years. ⇒ Nine of the 24 MNF MLAs defected to the Congress, and President’s Rule was imposed in the State in September 1988. ⇒ Again the previous Congress government came to power after the 1989 polls and continued its winning streak in the 1993 elections by forging an alliance with the Mizoram Janata Dal (MJD). ⇒ The two Opposition parties, the MNF and the Mizoram People’s Conference (MPC), formed a pre-poll alliance and won in the 1998 Assembly elections. MNF won in these elections. ⇒ In the 2003 Assembly elections, the MNF retained power after winning 21 seats while the Congress won 12 seats. ⇒ For the 2013 Assembly elections, Mr. Zoramthanga formed a prepoll alliance with the MPC and the Maraland Democratic Front (MDF). This was seen as essential by the MNF to wrest power from the Congress and reinstate itself as the guardian of the Mizo people’s political and cultural rights. ⇒ Today, Mizoram is a State that cradles several oddities. ⇒ It is a Christian majority state where the Presbyterian Church has immense sway over everyday life and politics. ⇒ It is one of the few States with Prohibition due to an intervention by the Presbyterian Church. ⇒ It is also one of the few States with a remarkably high voter turnout. ⇒ On October 21, 2013, 10 regional political parties in the northeast formed a new political front — the North-East Regional Political Front (NERPF). ⇒ It adopted 17 resolutions, which include an end to the Armed Forces Special Powers Act, a return to paper ballots and a fresh look at the Centre-State relations. ⇒ This development went unnoticed but the front will gain momentum after the counting of votes in Mizoram. ⇒ The formation of NERPF is a signal that regional parties in the northeast are ready to take on bigger roles at the Centre, and have realised that it pays to band together to secure the region’s interests. ⇒ They have realised that during the government formation in New Delhi in May 2014, they may be in a position to bargain hard, as every seat may matter. The normalisation of electoral politics in Mizoram is important as an instance of accommodative politics in India. The reduction in violence brought about by the end of the insurgency and the crippling counterinsurgency campaigns can perhaps be replicated in other States of the northeast. Which one of the following is the only reserved Lok Sabha constituency in Delhi?